Are you planning an autumn or winter wedding, birthday party or other event and are looking for the perfect party favors? Or perhaps, you're searching for an inexpensive small gift or giveaway for Thanksgiving, Halloween, New Year's, Valentine's day, Easter, 4th of July or other holiday. 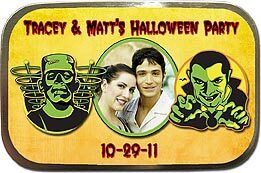 We have personalized photo mint tins that might be just what you're looking for. Choose one of our original seasonal or holiday designs, and we'll combine it with your photo and personalization. 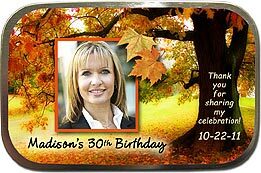 If you love the photo candy tins, but don't want to include a photo, we can just add your message to the design. It's up to you. These large unfilled favor tins are big enough to hold a gift card or small gift, but you can also fill them with mints, candy, chocolates or whatever treats you like. 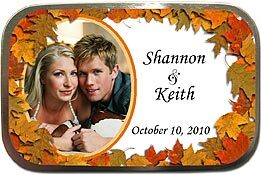 Great for ANY occasion in the fall - wedding, birthday, anniversary, etc. Autumn Scene Photo Mint Tins © Email us 1 of your favorite photos with your message and personalization. Great for autumn party of any occasion. 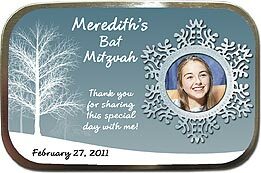 Winter Magic Photo Mint Tins © Email us 1 of your favorite photos with your message and personalization. Great winter wedding, birthday for any occasion in winter or winter wonderland theme party. 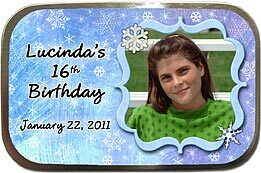 Snowflake Photo Mint Tins Email us 1 favorite photo with your message and personalization. Great for sweet 16, bat mitzvah, birthday, ANY occasion in the winter. Winter Photo Photo Mint Tins © Email us 1 favorite photo with your message and personalization. Great for any winter party. 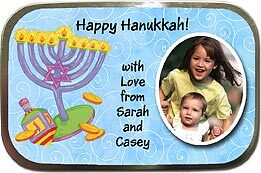 Hanukkah Unfilled Photo Mint Tins © Email us 1 favorite photo with your message and personalization. 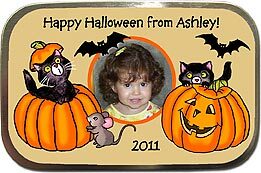 Halloween Monsters Photo Favor Tins © Email us 1 of your favorite photos with your message and personalization. 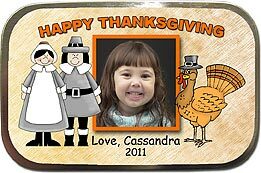 Pilgrims Thanskgiving Photo Mint Tins © Email us 1 of your favorite photos with your message and personalization. Cornucopia Thanksgiving Mint Tins © Email us 1 of your favorite photos with your message and personalization. 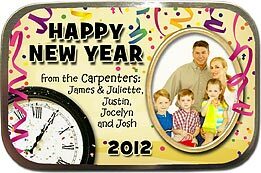 Happy New Year Photo Mint Tins © Email us 1 of your favorite photos with your message and personalization. 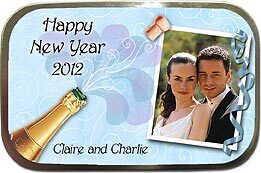 Champagne New Year Mint Tins © Email us 1 of your favorite photos with your message and personalization. 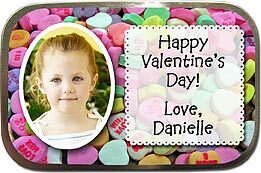 Candy Hearts Photo Mint Tins © Email us 1 of your favorite photos with your message and personalization. 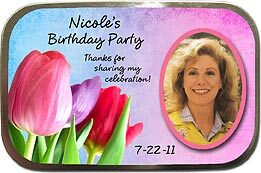 Springtime Tulips Photo Mint Tins © Email us 1 of your favorite photos with your message and personalization. 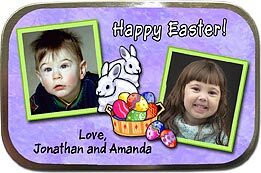 2 Photo Easter Basket Photo Mint Tins © Email us 2 of your favorite photos with your message and personalization. 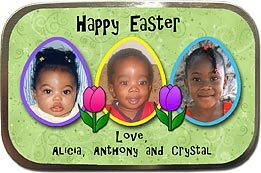 3 Photo Easter Eggs Photo Mint Tins © Email us 3 of your favorite photos with your message and personalization. 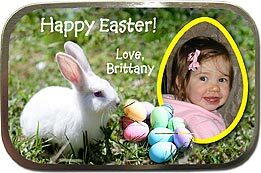 Easter Bunny Photo Mint Tins © Email us 1 of your favorite photos with your message and personalization. 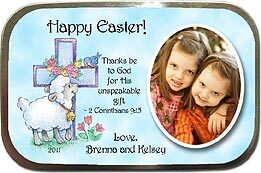 Lamb & Cross Easter Photo Mint Tins © Email us 1 of your favorite photos with your message and personalization. 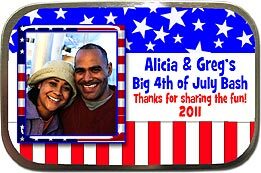 Patriotic Red White & Blue Mint Tins © Email us 1 of your favorite photos with your message and personalization. Fireworks Photo Mint Tins © Email us 1 of your favorite photos with your message and personalization. 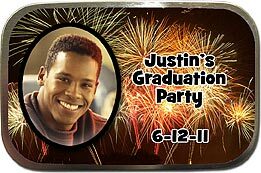 Great for 4th of July, New Years, birthday, graduation or any celebration. If you're looking for mint tins for the Christmas holiday season, you can find them on our Christmas Photo Mint Tins page.